Phantom Leader places you in command of an Air Force or Navy squadron of fighters in the hostile skies of the Vietnam War! Each pilot under your command has individual skills. Each aircraft also has individual ratings. You get to select the best mix of pilots, aircraft, and munitions for each mission. Do a good job, and lead your squadron to victory. However, do too good of a job, and the politicians back home will place limitations on your future missions and tactics. Welcome to the Vietnam Air War! 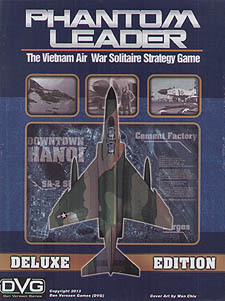 Phantom Leader includes 4 historical aerial campaigns: War In The South, Rolling Thunder, Linebacker and the Cuban Missile Crisis. Each can be played in 3 different campaign lengths, by either an Air Force or Navy squadron! Aircraft include: F-4 Phantom IIs, F-105 Thunderchiefs, F-100 Super Sabres, F-104 Starfighters, A-6 Intruders, A-7 Corsair IIs, F-5 Freedom Fighters, F-8 Crusaders, EA-6A Prowlers, F-101 Voodoos, F-102 Delta Daggers A-3 Skywarriors, E-1 Tracers, E-2 Hawkeyes, F-105 Wild Weasels, and A-4 Skyhawks! Phantom Leader is a Solitaire game. You command jet fighters and make historically accurate decisions, while the built-in game system generates the missions and controls the opposing forces. This means you can play the game at your own pace, whenever, and wherever you choose.